Clark Solutions is proud to offer the Almemo line of high accuracy measuring instrument, data acquisition, and data logging systems. The Almemo system features measuring instruments and intelligent connectors for reporting a wide variety of sensor outputs. Almemo instruments and data loggers are used routinely in testing laboratories, research facilities, and industrial monitoring applications. 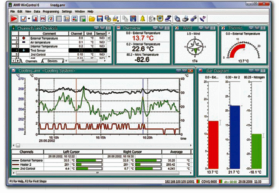 Enable measuring & datalogging instruments to communicate with its environment, i.e., transfer measured data to peripheral equipment, execute commands from a computer, trigger alarm signals, and respond to switching pulses.